They surprised some investors by leaving their U.S.-based peers in the dust. 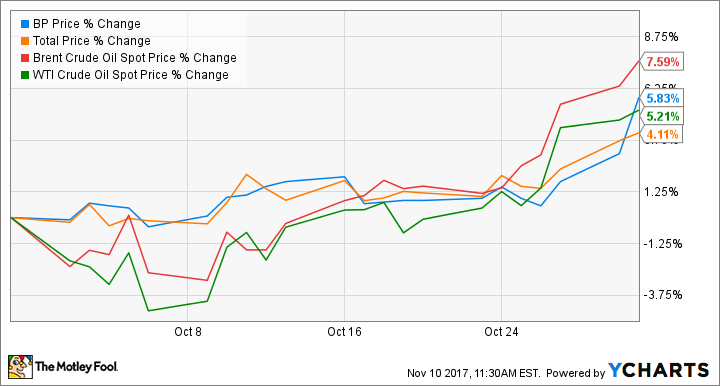 Shares of BP (NYSE:BP) and Total SA (NYSE:TOT) jumped in late October to finish the month up 5.8% and 4.1%, respectively. That handily beat the performance of their U.S.-based peers ExxonMobil (NYSE:XOM), which finished up just 1.7%, and Chevron (NYSE:CVX), which actually finished down 1.4%. Luckily for investors, the reasons are pretty straightforward. In October, the stock market was kinder to oil majors from overseas than to their U.S. industry counterparts. Image source: Getty Images. BP reported third-quarter earnings on Oct. 31 and pleased investors with the announcement it would begin share buybacks, while Total posted strong Q3 earnings on Oct. 27, so combined with improvements in oil prices, it's pretty obvious why their shares would move higher. As for Exxon and Chevron, you can probably guess what happened: Both released earnings that concerned investors. For Chevron, lower sequential quarterly production spooked Wall Street, causing the stock to sharply tumble. Exxon also reported lower sequential quarterly production, but solid across-the-board performance from all three of its business units may have helped to prevent its stock from dropping like Chevron's. Chevron's and Exxon's lackluster post-earnings stock performances make sense, to a point. With oil prices finally seeming to be on the rise, companies that are pumping out less oil should make less profit. However, that overlooks Exxon's improving fundamentals and exciting offshore discoveries in Guyana. It also perhaps underestimates Chevron's Permian Basin potential. But for BP and Total, the market seems right to be bullish. Even after October's price gains, both companies yield excellent dividends (BP's yield is a best-in-class 5.9%, while Total's 4.9% is also excellent) and have shown they can keep costs in check while expanding production. If oil prices continue to cooperate -- and that's a big "if" -- investors should expect continued outstanding results from both companies.